I fancied some salt and vinegar crisps with which to watch the football on TV, so I made some. 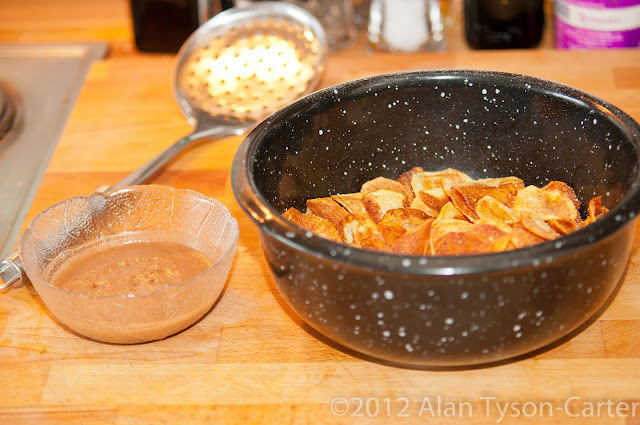 The crisps I seasoned with vanilla salt (home made), coarsely ground and the vinegar I foamed up. However as you can perhaps see from the photo, the vinegar air (as it's called) quickly looses its foam consistency which is a shame. What did I do wrong? I used one leaf of gelatine to 100ml of water and 150ml of balsamic vinegar. My gourmet whip is a litre version and so I charged it with three gas cartridges, since the first attempt with two was an even worse failure. Obviously one has to shake the whip vigorously, and really great foam comes out, it just doesn't stay that way long. Perhaps I had not left it in the fridge long enough for the gelatine to set properly? Or perhaps two sheets of gelatine would be better? Well the football starts on the TV in 10 mins so I can wait that long. The crisps will not last much beyond the ten minutes, though, as they are a complete success and melt in your mouth.